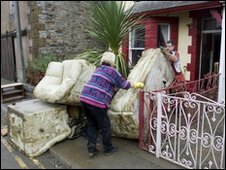 Flood-hit householders in one Cumbrian district are to pay less for their council tax until their homes become completely habitable again. Some residents in South Lakeland have been living in the upstairs of their homes because the ground floor was damaged in the November floods. South Lakeland District Council has granted those residents a 50% discount on their council tax. It will run until the buildings are habitable or 31 March 2011. The cost to the council is estimated to be a maximum of £10,000, depending on the number of households that qualify. In November thousands of homes and businesses were severely damaged in devastating floods which swept the county. Existing legislation only exempts householders from paying council tax if the property is completely uninhabitable and unoccupied. Simon McVey, the council's assistant director of customer focus, said: "The council has created a special locally defined discount for occupied properties affected by the flooding. "As people are really only occupying half their house the council would like to offer a 50% discount on their council tax. "It does not seem very fair that people are having to pay full council tax when through no fault of their own they can only live in part of their property."